This page displays a variety of the art that I do that is not on paper or board, more or less. I like to do carving in wood and/or ivory, leatherwork, and some costuming for my SCA pursuits. This page will show some of these pieces (with the exception of the musical instruments, which are listed separately). 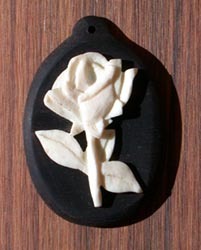 This was my first experiment in carving ivory. I used fossil mammoth ivory which initially was slightly brown, but sanded and polished to ivory white to my surprise. 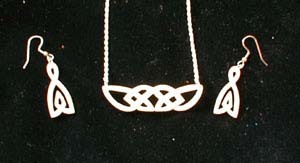 Basic celtic-style knotwork patterns. There actually is a 3-D effect to the knotwork, but the camera I had at the time glared everything out. The originals became a present to my mother-in-law. This is a nice rosette knotwork bit out of the mammoth ivory, done mostly as a practice piece for the rosette for the fancy citole. 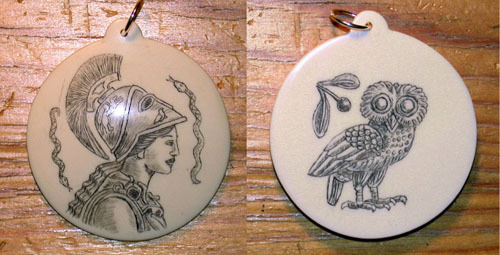 I widened one of the outer loops to make it into a pendant. 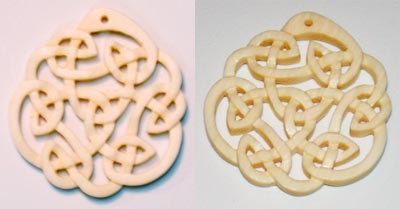 The knotwork is carved as a 3-D effect. The mammoth ivory is a little yellower than the elephant ivory. Whole piece is about one and 3/8 inches across at widest point, and about 1/8 inch thick. 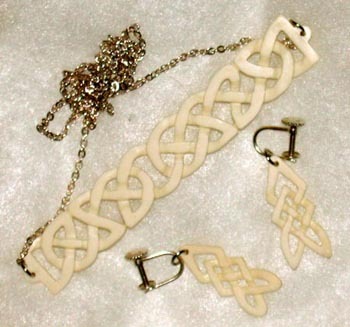 This is a set of matching ivory knotwork pendant and screwback earrings I made for my mom after she saw the other bits and wanted some. They are fashioned from old piano key tops (which is a good source of ivory, and a nice recycling of a rare material). 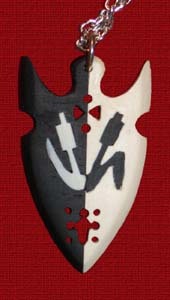 Pierced style arrowhead done as a prize in an archery contest in our medieval re-enactment group. Modeled after a gold arrowhead given as a prize in a tournament in England around 1400. Pierced and inlaid decorative arrowhead done in ebony and ivory (please don't sing, thank you) with sterling silver chain. This one was also done as the badge for the Iron Bog archery champion, the medieval re-enactment group to which I belong. 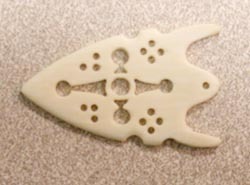 The ebony and ivory were joined edge to edge (this is only about 1/8" thick at center), and the tiny cat-tails (black and white cat-tails are symbols of the Shire of Iron Bog) were separately carved and then inlaid into the ivory/ebony respectively. The inlays are about 1/16" or less thick. Serious pain to carve. But I think it came out rather nicely. American holly wood, about 5 1/2 inches long. Forked hairstick. This was an experiment as well. I had heard about a English luthier copying a gorgeous lute made entirely of ivory. He wasn't able to get actual ivory for the construction, however, as it cannot be imported into England. So he used American holly tree wood, which is a fairly inexpensive hardwood. The final product in pictures looked almost exactly like the ivory original, which rather astounded me. So I decided to try something in holly wood and see how it came out. I found some holly pen blanks on eBay, and decided to make a hairstick for my wife (she collects hairsticks - she wears them almost all the time during the summer). I asked her what she wanted on it, and she said a bunny - so here is the bunny stick! The bunny itself is a little over an inch long, and I personally think it looks hilarious on her - gives the illusion of a white rabbit happily munching in the grass of her hair. I also haven't carved in the round in over a decade, so it was fun from that perspective too. The hairstick has been lacquered to make it waterproof, which is what is causing the glaring in the photos. An attempt at relief carving in the ivory. This is actually an old piano key top, mounted on some ebony originally cut to do inlay on the elaborate citole. I had done a fair amount of the piercing style carving to this point, but hadn't tried actual relief carving, much like I'd been doing on a larger scale for the decorated citole. I'd wanted to try the rose design for a while, and originally made this as a prize for a fencing tournament. It ended up not being used, so now I just have it around. The brown wood behind it isn't actually part of it - just something I shot it against as a pretty background.